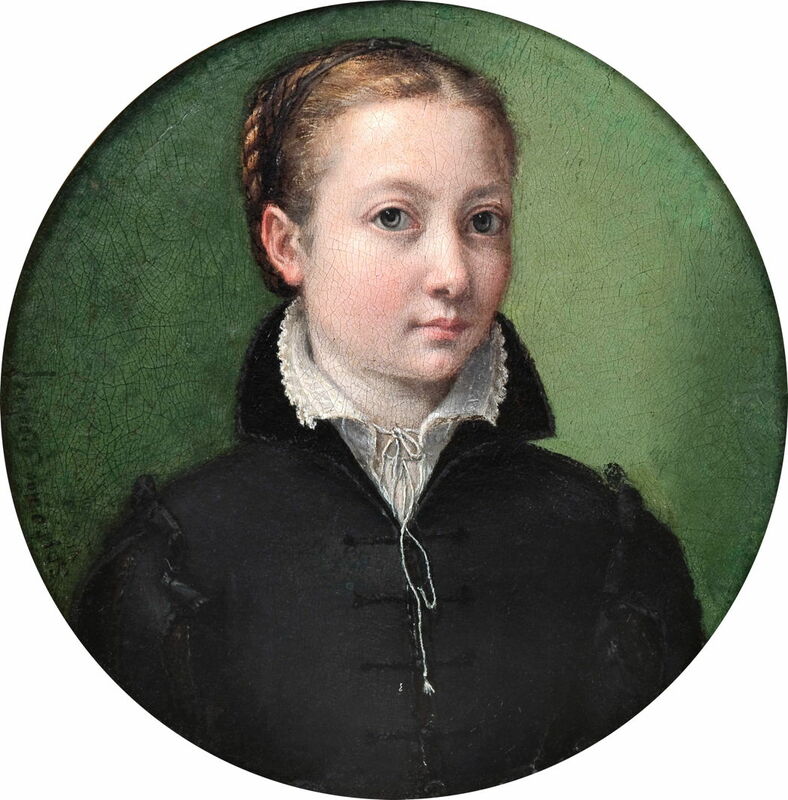 Sofonisba Anguissola (1530–1625), Self-portrait (date not known), oil on panel, diameter 13.2 cm, Private collection. Wikimedia Commons. Making a highly successful career for yourself as a woman artist in the Renaissance was an extraordinary if not unique feat. It is one of the many accomplishments of Sophonisba Anguissola (c 1532-1625), who also managed to survive the ravages of infectious disease, and died in her early nineties. Even more unusually, she was not born into an artistic family, but into minor nobility, in Cremona, Lombardy, Italy. The oldest of Amilcare Anguissola’s seven children, the family claimed ancestry going back to ancient Carthage. Amilcare and his wife Bianca educated and encouraged their daughters to develop their abilities, which resulted in four of their six girls becoming painters, but it was only Sophonisba who persisted long enough to make a career of her art. When she was fourteen, Sophonisba went to study in Bernardino Campi’s workshop, then to Bernardino Gatti’s. She probably completed her training in about 1553, but by then was already painting some outstanding works in oils. 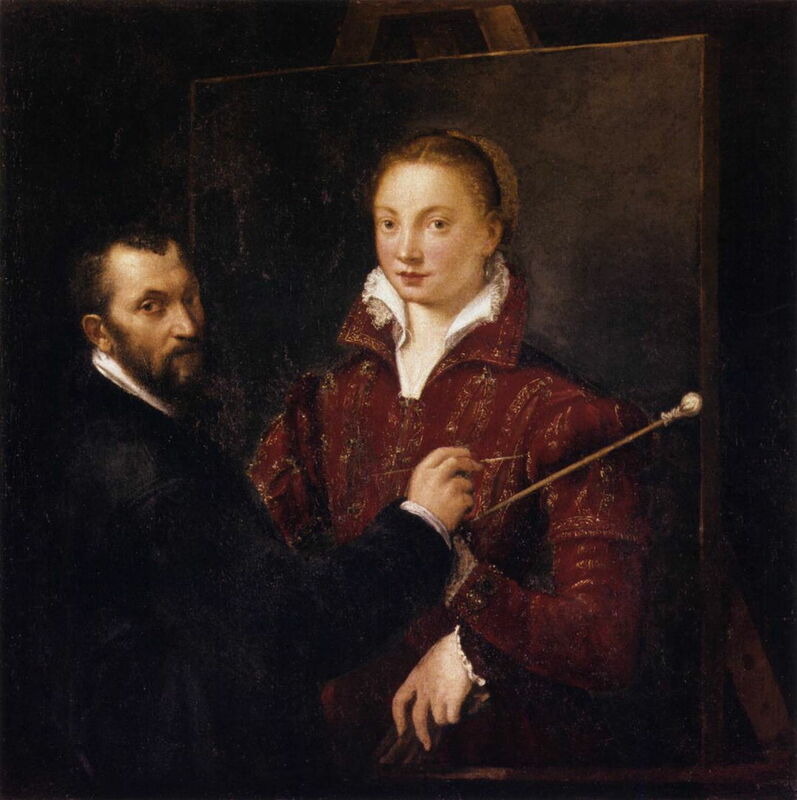 Sofonisba Anguissola (1530–1625), Self-portrait with Bernardino Campi (1550), oil on canvas, 111 x 109.5 cm, Pinacoteca Nazionale, Sienna, Italy. Wikimedia Commons. One of her earliest surviving paintings is also one of her most remarkable and ingenious, her Self-portrait with Bernardino Campi, painted in 1550 when she was just eighteen. This double portrait is fascinating in her depiction of two left hands on the portrait which Campi is shown working on: one reaches up to meet his right hand, which holds a brush, and the other holds her own brushes. 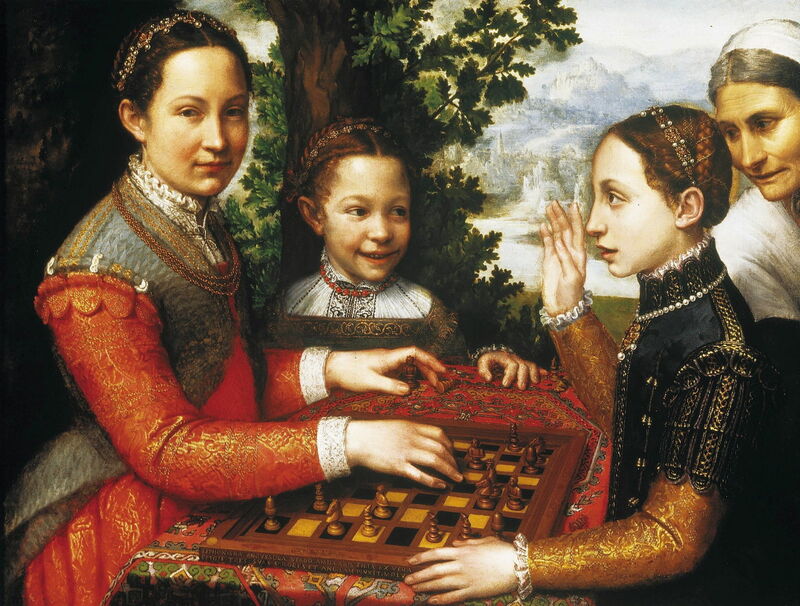 Only five years later she transformed Renaissance portraiture with her superb The Chess Game (1555), showing her sisters playing chess, with their mother (probably) making an appearance at the right edge. Her sisters, Lucia, Minerva and Europa Anguissola, are shown dressed in their finest, but the informality of their poses and expressions is striking, and innovative in portraits at that time. Anguissola’s attention to detail in clothing and on the table is also notable, and perhaps more characteristic of the Northern Renaissance. Her other portraits are just as finely detailed. 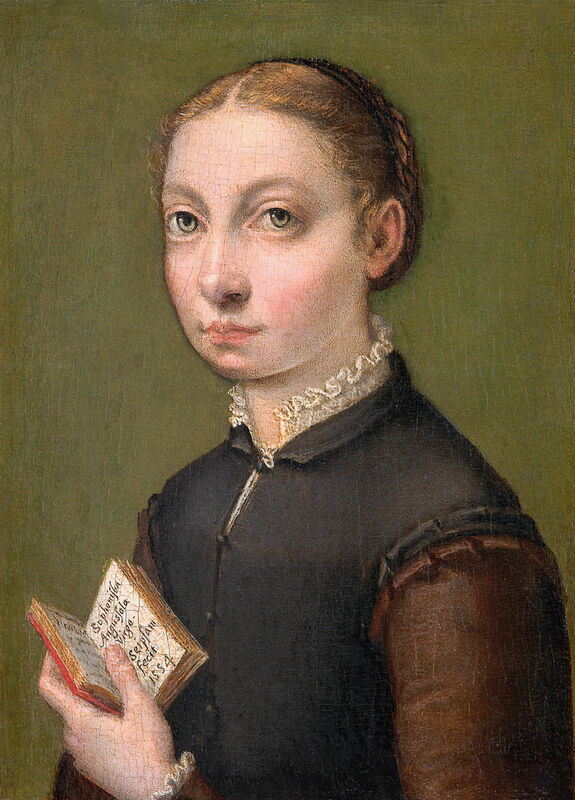 Sofonisba Anguissola (1530–1625), Self-portrait (1554), oil on poplar wood, 19.5 × 12.5 cm, Kunsthistorisches Museum, Vienna, Austria. Wikimedia Commons. In addition to painting her family, she also completed a series of self-portraits in her early career, including this Self-portrait from 1554, when she was twenty-two. The contrast with the fine dress and relaxed informality of her family portraits is interesting, and may reflect her almost austere devotion to her art. Sofonisba Anguissola (1530–1625), Self-portrait at the Easel (1556), oil on canvas, 66 × 57 cm, Zamek Lubomirskich i Potockich w Łańcucie, Łańcut, Poland. Wikimedia Commons. A couple of years later, Self-portrait at the Easel (1556) shows her working on an exquisite devotional painting which may have been of the Virgin and Child, showing the deep relationship between a mother and her infant, and another painting within a painting. The artist sustains her austere devotion. This small undated Self-portrait on a tondo is no more relaxed. 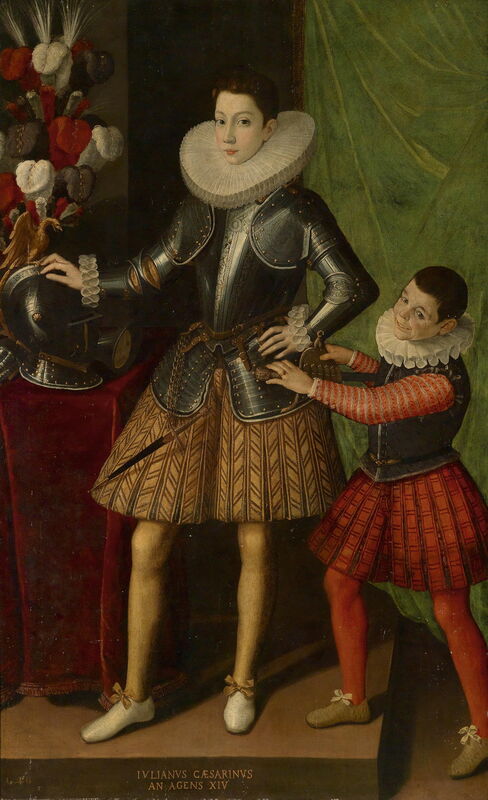 Sofonisba Anguissola (1530–1625), Portrait of the Artist’s Family (Portrait of Amilcare, Minerva, and Asdrubale Anguissola) (1557-58), oil, dimensions not known, Nivaagaards Malerisamling, Nivå, Denmark. Wikimedia Commons. Her Portrait of the Artist’s Family of 1557-58 maintains her style of informality in poses, although its composition is more typical of the day. This shows her younger sister Minerva, father Amilcare, and young brother Asdrubale, with a fantasy landscape of classical ruins and the rising towers of distant castles, receding to a dramatic mountain. In 1554, she stayed in Rome, where she met Michelangelo and several other artists. Michelangelo seems to have mentored her for a while. She became an established portraitist, and in 1559 was invited by King Philip II of Spain to teach painting to his wife, the young Queen Elisabeth of Valois. Anguissola painted many important portraits when she was in Philip’s court, and prospered as a result. 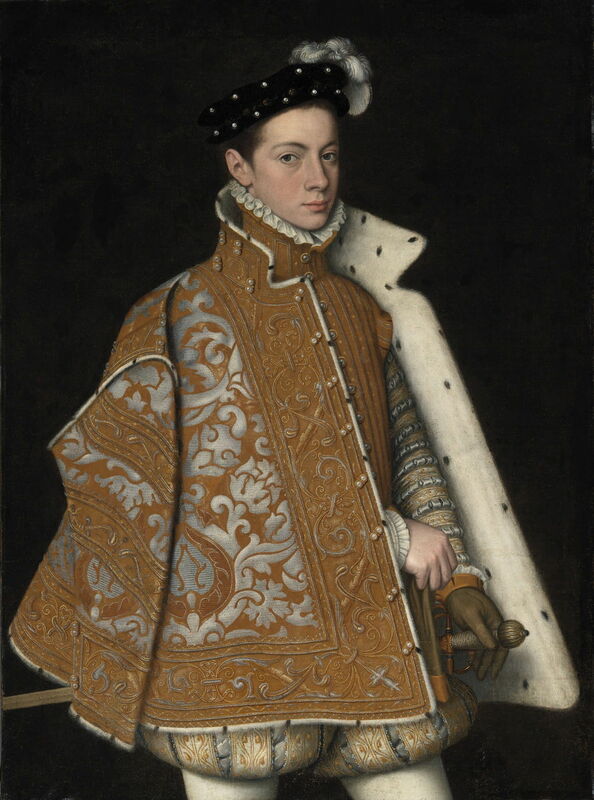 Sofonisba Anguissola (1530–1625) (attr), Portrait of Prince Alessandro Farnese (1545-1592), later Duke of Parma and Piacenza (c 1560), oil on canvas, 107 × 79 cm, The National Gallery of Ireland / Gailearaí Náisiúnta na hÉireann, Dublin, Ireland. Wikimedia Commons. This fine Portrait of Prince Alessandro Farnese from about 1560 has been attributed to Anguissola. The prince, who later became Duke of Parma and Piacenza, lived from 1545-1592, and this portrait conforms to more standard practice. Sofonisba Anguissola (1530–1625), Portrait of Anna of Austria (1549-80) (1573), oil on canvas, 86 × 67.5 cm, Museo Nacional del Prado, Madrid. Wikimedia Commons. Anguissola’s Portrait of Anna of Austria of 1573 was one of her more important commissions. Anna (1549-1580) was the fourth wife of her uncle, King Philip II of Spain, and the daughter of the Holy Roman Emperor Maximilian II. 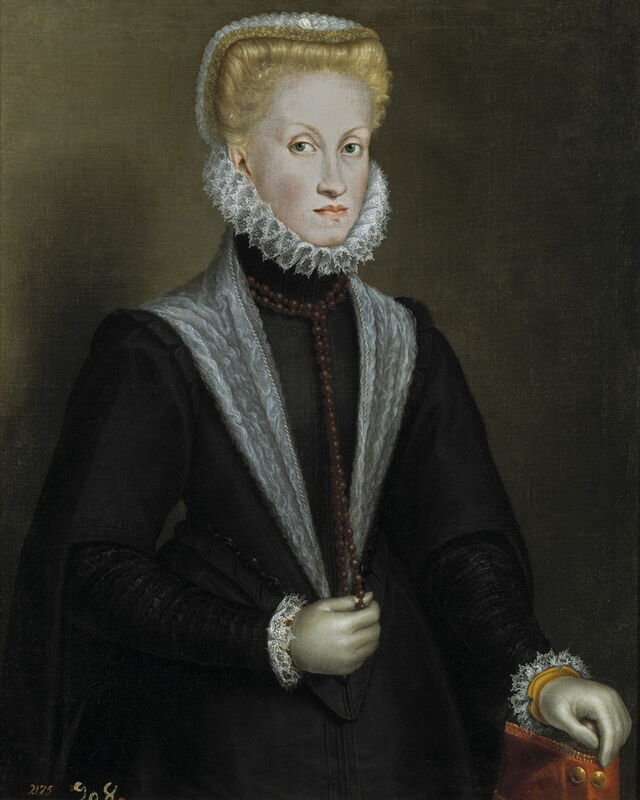 She married the king in 1570 following the death of Queen Elisabeth of Valois, who had been Anguissola’s pupil. Among Anna’s other portrait painters was Giuseppe Arcimboldo, later famous for his unique ‘vegetable’ portraits. 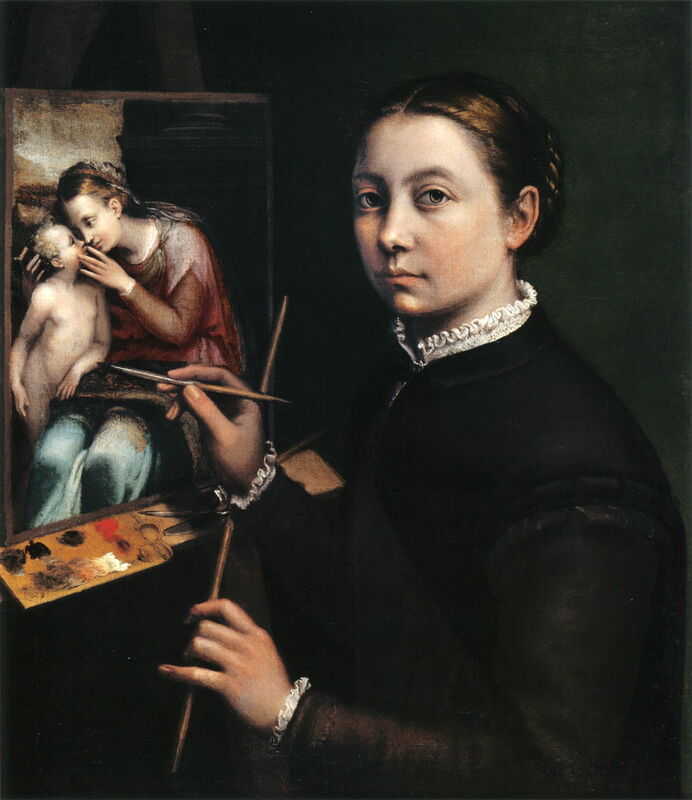 Although Anguissola herself had married a noble in 1571, she continued to paint professionally, and the couple moved to Paternò, near Catania on the east coast of Sicily. Her first husband died eight years later, and in 1584 she married again, moving to Genoa. Sofonisba Anguissola (1530–1625), Portrait of Julius Caesar Aged 14 (c 1586), oil on canvas, 186 × 115 cm, location not known. Wikimedia Commons. This unusual Portrait of Julius Caesar Aged 14 from about 1586 shows, according to its inscription, the famous Roman emperor, who lived from 100-44 BCE, when he was assassinated in Rome. Anguissola has approached it as another of her informal portraits, rather than as a history painting. 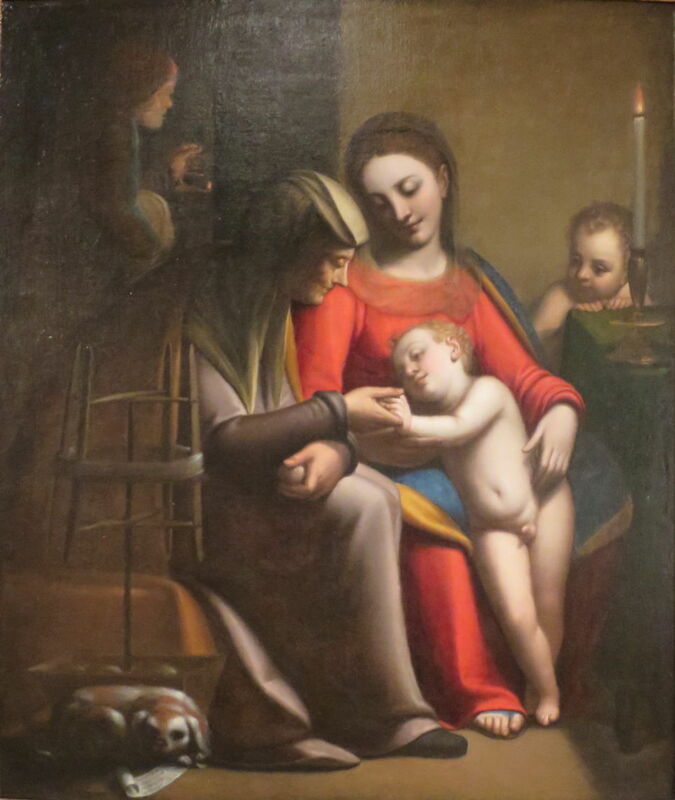 Sofonisba Anguissola (1530–1625), The Holy Family with Saints Anne and John the Baptist (1592), oil on canvas, dimensions not known, Lowe Art Museum, University of Miami, Coral Gables, FL. Wikimedia Commons. 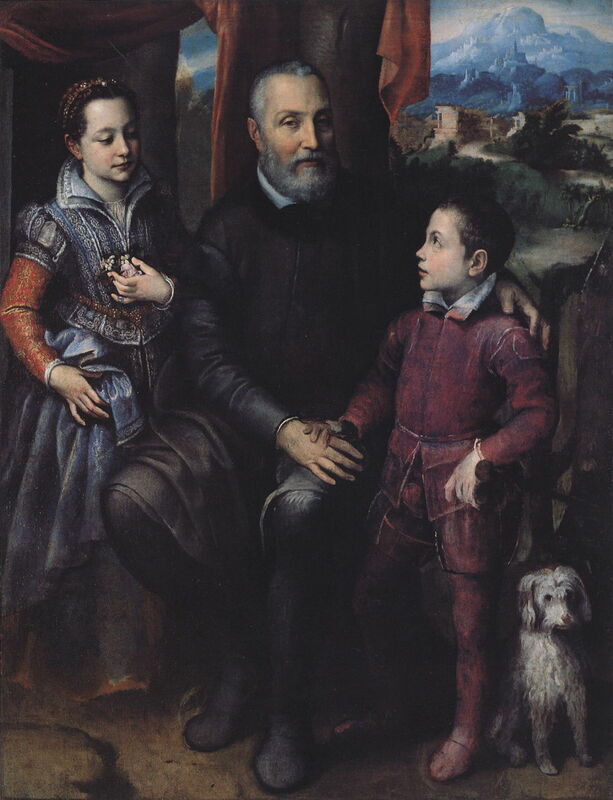 Anguissola’s religious paintings broke new ground in the intimacy with which she shows family scenes, as in The Holy Family with Saints Anne and John the Baptist (1592). I apologise for the slightly unfocussed image, which is the best that I have been able to locate. She taught and provided advice to other painters throughout her later career, and in 1624 was visited by the young Anthony van Dyck. Her sight was failing by that time, but she was still able to give good advice to van Dyck which remained important through his career. Finally, Anguissola moved to Palermo, where she died at the age of 92 or 93 in 1625. She had no children, but left a generation of artists who had benefitted from her innovation and influence. Among those directly inspired by her example and work was Lavinia Fontana. Over two centuries later, Ella Sophonisba Hergesheimer pursued her painting career bearing Anguissola’s name. Posted in General, Painting and tagged Anguissola, Arcimboldo, Fontana, Hergesheimer, painting, portrait, renaissance, van Dyck, women in art. Bookmark the permalink.